Who Else Wants to Learn How To Make Money Online? Brand New Ebook Reveals 21 Proven Income Streams That You Can Use to Make Money Online Anytime You Want! Multiple Ways to Make Money Online"
If you're looking for ways to make money online and quickly produce a recurring monthly income but don't have a lot of time to devote to it every day then I have good news for you. Maybe you want to make money online to supplement your paycheck from a low paying job. If you're a college student, unemployed or retired, or anyone else who wants to learn how to make money online then this is for you too. Possibly you need spare cash to pay your bills or money to go out and have a good time. Whatever your situation may be, if you want to learn quick and easy ways to make money online then I have just what you need! Your Struggle To Make Money Online Will be Officially OVER After You Read 21 Income Streams! 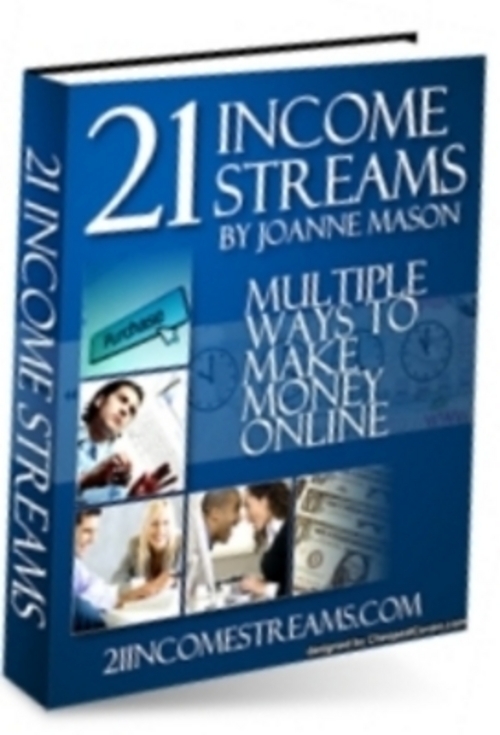 Unlike some other ebooks about making money online, 21 Income Streams is not a bunch of theories or far fetched ideas. These are surefire methods that I have seen first hand and can attest to the money making potential in every single one. This is rock-solid information and I personally guarantee that these techniques can work for you. This ebook contains no hype, no fluff and no overrated promises...just simple, practical ways that you can immediately begin accomplishing your goal of making money online! Here's your opportunity to receive "21 Income Streams" including Master Resale Rights for Just $14.95! I can honestly tell you that "21 Income Streams" is a great opportunity to gain the information that you need on how to quickly and easily increase your income! Plus this offer is reserved for a VERY limited time only so if you're serious about learning how to make money online starting TODAY then go ahead and order now! How To Do Just About Anything To Make Money Online! Fast Track To Online Profits - Mrr!